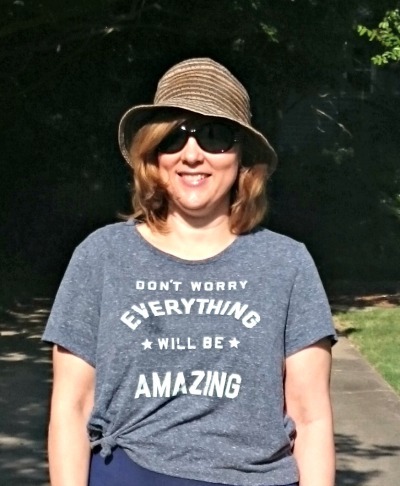 “Don’t Worry Everything will be Amazing” tshirt I bought last year. A great way to start a Monday! I thought I would show you my rolling shopper bag that accompanies me on my grocery store walks. I bought it from Amazon, Here. It comes in several other colors and really holds a lot. I use to walk home with a few bags and women in my neighborhood always stopped to ask me if I needed a ride. I greatly appreciated their generosity, as I don’t know them, but I love the exercise and sunshine from walking, so now I can do it without having full arms and catching the attention of others. We had temperatures near 90 today, but a nice breeze, that almost took my hat off. The best part of my walk to the store was the two of my kids joined me this time. I must admit the other fun part was the swing in my skirt… It’s just an inexpensive fold-over waist skirt , I bought last year. You can find one similar at Old Navy Here. 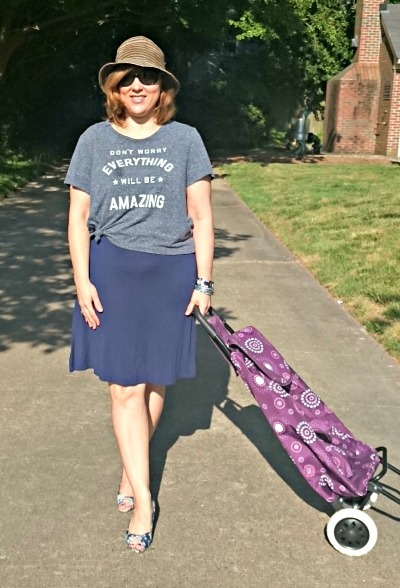 They really are a fun casual skirt, perfect for my Mom on the Go lifestyle. Dear Readers. I am still going through closets, the master walk-in had everything removed for the carpet that was put in, and I have to admit we had a lot of space bags of clothes tucked behind the hanging ones, as well as boxes of papers. Today I managed to go through mine, my goodness how many pairs of winter pj’s does one woman need. I donated all but three sets. In good news all my workout gear for Summer is now in the wash. So today marks the end of my going through every article of clothing and deciding what to keep or to donate. The beauty of my new bed with drawers is that there is a ton of space underneath, which I put suitcases and space bags of winter items… No longer will they be stored in the closet and they are totally hidden. In fact, I had to remove a drawer in order to get them under the bed. I love this extra storage space and how much neater my closet now feels. Now if only my dear husband would go through his clothing as well. I am grateful for a good night’s rest and the energy I found on a Monday to get so much done today! I am grateful for AC, as I cannot stand the heat! I am grateful for the fun I had taking blog photos, my daughter kept telling me I was grimacing. It was hard today because there is a detour and ten times the traffic on my street, so I was feeling very self conscious! I am grateful that I finished my vegetable casserole today and that nothing went to waste. I am grateful that my son gave up the idea that he needed to repaint my old dressing room, and went ahead and moved in last night, as the stuff in the hallway was driving me nuts. I am grateful that my three kids home all hang out together in one room late into the night. 4 Responses to "Graphic Tee & Swingy skirt"
Tracey, I LOVE this outfit. You look so cute! How awesome that you walk to the grocery store! I can too but have never even given a thought. Love those pretty flats on you. Lovely flats and I like the ease of your outfit! Like the stroller too, we buy so much from Amazon, we are like a warehouse! Thank you, yes Amazon is a big one for me too!